Try Bluemix for 30 days! Your free trial includes 2 GB runtime memory and 10 service instances. Start your free trial. It is designed for scale in many ways (multi-site, multi-tenant, massive amounts of data). It is easy to use and yet meets the growing demands of enterprises for a broad expanse of applications and workloads. It allows users to balance storage cost, location, and compliance control requirements across data sets and essential applications. Due to its characteristics, object storage is becoming a significant storage repository for active archive of unstructured data, both for public and private clouds. IBM® Cloud Object Storage provides industry leading flexibility enabling your organization to handle unpredictable but always changing needs of business and evolving workloads. This IBM Redpaper™ publication explains the architecture of IBM Cloud Object Storage and the technology behind the product. 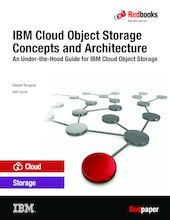 In other words, it is an under-the-hood guide for IBM Cloud Object Storage. The target audience for this paper is IBM Cloud Object Storage architects, IT specialists, and technologists.